'Beaver Brook Farm', the Henry L. Batterman estate designed by Harrie Lindeberg c. 1914 in Mill Neck. Click HERE for more on 'Beaver Brook Farm' which was demolished c. 1950. 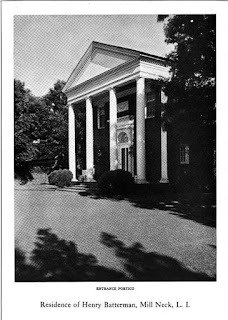 Photo from Arts & Decoration, 1919. I was so sure Stanford White designed this house. Oh well, at least we know Samuel Yellin made the doorknobs.